Managing virtual machines doesn’t have to be hard. Where did all my storage go? Check if your discs are over-provisioned and manage your snapshots. Can I plan for future workloads? Synthetically model capacity planning scenarios. Am I throwing away CPU power? Execute recommendations for over- or under-allocated CPUs. We’re here to make virtualization management easier. How do I know my VMs are configured correctly? How is storage I/O contention affecting the end-user experience? What objects are causing performance problems? What’s the easiest way to clean up VM snapshots and reduce sprawl? Comprehensive virtual machine (VM) monitoring, performance management, capacity planning, and optimization. Complete visibility across VMware and Hyper-V—whether on-premises, hybrid, or in the cloud—and how your virtualization is connected to applications, servers, and storage infrastructure. Monitor and alert on Azure and AWS infrastructure metrics, in the same dashboard as your on-premises or hybrid virtual environment. The SolarWinds® Virtualization Manager (VMAN) console is designed to execute a variety of VM monitoring and management actions without jumping to a separate tool. These actions can be triggered manually or through customized alerts or scripts, allowing you to optimize your resources. Reclaim virtual resources with VM sprawl alerts and recommendations. Virtualization Manager VM management software is built to automatically identify opportunities to free up processing and storage resources, which can help improve overall performance. Resolve issues with a single click. Gain insight into the performance, capacity, and usage of your virtualized infrastructure, including hosts, VMs, clusters, containers, vSANs, and other datastores. VMAN's VM monitoring software can help remediate virtual machine issues with built-in management actions without needing to log in to a hypervisor. Recommendations for optimal VM size and placement. Actionable Intelligence can allow for single-click remediation of active and predicted recommendations to optimize virtual machine performance and resource allocation. Recommendations can be individually selected or multi-selected to be run immediately or scheduled to run at a later date and time. Reclaim resources back into the virtual pool. Power off idle VMs and delete powered-off VMs, orphaned VMDK files, and snapshots to reclaim resources with Virtualization Manager’s VM sprawl control management tool. Virtual machine performance monitoring and resource planning. Predict CPU, memory, network, and storage needs for VMware vSphere and Microsoft Hyper-V. Run modeling scenarios to learn how best to support new workload, or run a checkup to ensure your resources are in alignment with current usage. Quickly monitor and report on vSAN capacity and performance. View dedup and compression, before and after statistics, free space, overallocated ratios, and more to help ensure you have the necessary capacity. Gain visibility into clusters performance with failed health check monitoring and VM latency breakdown. Monitor your cloud infrastructure, as well as your hybrid and on-premises virtualization. Monitor and manage IaaS services for Amazon EC2 instances and Microsoft Azure VMs from the same console as your on-premises virtualization environment. Show complete visibility of the virtualization stack. Quickly assess the health of your entire environment—whether it’s server, virtual, or storage infrastructure—and troubleshoot specific, interrelated problems from one view. Near real-time VMware event monitoring. 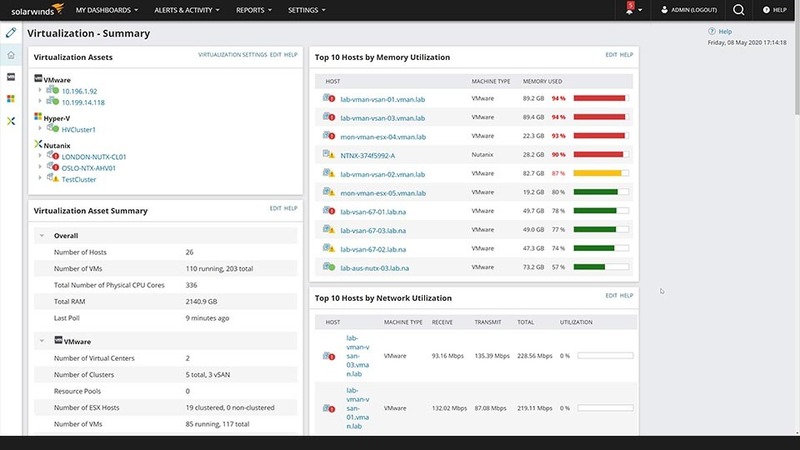 SolarWinds VMAN virtual machine monitoring tool is built to provide near real-time event correlation, alerting, reporting, and performance monitoring for VMware environments. Using VMAN’s PerfStack™ feature, you can speed root cause analysis by correlating performance spikes to events such as VM migrations, creation, and configuration changes. VM monitoring for vSphere, Hyper-V, Azure, and AWS. Uncover and resolve issues unique to vSphere, Hyper-V, Azure, and AWS using intuitive dashboards and alerts with clickthrough to greater detail. Active virtualization alerts are categorized as critical, serious, warning, and informational. Performance, storage, and capacity planning dashboards allow you to quickly focus on the task at hand. Predict, prioritize, and resolve issues before they affect end-users. The PerfStack dashboard within VMAN’s virtual machine monitor software allows you to drag, drop, and overlay VM management tool performance metrics from your systems data and multiple sources (network, virtualization, storage, or database), and view data types on a single chart. Features Overview Comprehensive virtual machine (VM) monitoring, performance management, capacity planning, and optimization. Virtualization Manager is an industry favorite. Hands down. "We use VMAN to monitor every aspect of our VMware virtual environment. We monitor everything from resource usage to hardware issues. Because of VMAN, we have been able to move VMs around to maximize efficiency on every level." "We use it to keep track of the entire virtual infrastructure right down to the VMs running on our hosts." Where can I find information on installation and customization for my VMAN product? Does SolarWinds offer training or certification for the VMAN product? Our New to VMAN section was created using customer feedback and contains videos, guides, and articles that will help you be more successful with your installation and customization. SolarWinds offers an onboarding assistance program called Smart Start if you are looking for help getting VMAN set up and optimized. We will provide you with access to one of our implementation experts who will work with you to understand your goals, assist you in installing and configuring your product, and help you optimize your environment for how you need your business to run. What is virtual machine monitoring? Virtual machine monitoring allows you to fix performance issues and optimize resources for VM performance. Gain insight into the status and performance, capacity, and usage of your virtualization infrastructure, including hosts, VMs, clusters, containers, vSANs, and other datastores. With this information, you can identify performance bottlenecks and remediate virtual machine issues without logging in to a hypervisor. You can set thresholds and critical warning alerts to match your specific business needs and parameters. VMAN virtual machine monitor is also designed to deliver predictive recommendations to address active or potential performance issues. Visibility across Hyper-V and VMware performance—whether on-premise, hybrid, or in the cloud—helps you have a more comprehensive understanding of your virtualization environment. VMAN can help you uncover issues unique to VMware vSphere and Microsoft Hyper-V performance using intuitive presentation of alerts with click-through to greater detail for analysis. Corresponding virtual machine monitor dashboards allow faster troubleshooting, without the need to jump to separate tools for each hypervisor. Quickly assess the health of your entire environment—whether it’s server, virtual, or storage infrastructure—and troubleshoot specific, interrelated problems from one view. The main objective of this virtual machine monitor platform is to facilitate end-to-end IT monitoring with absolute ease. Drag, drop, and overlay performance metrics from your systems data and multiple sources (network, virtualization, storage, or database), and view data types on a single chart.